In a game that wasn’t as close as the final score appeared, the Halifax Mooseheads scored a 5-3 victory over the visiting Acadie-Bathurst Titan in the 11th annual Pink in the Rink night. 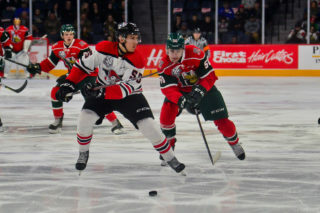 Samuel Asselin led the charge with a pair of goals as the Mooseheads dominated the play and out-shot the Titan 34-13 in front of a Friday night crowd of 7,781. Asselin’s newly formed line with Arnaud Durandeau and Benoit-Olivier Groulx was excellent throughout the game and combined for five points in the win to improve Halifax’s record to 31-10-2-1 on the season. “Two great players, Asselin can put the puck in the net and Groulx works hard and does a lot of things right. It was our first game together and I think we just clicked,” Durandeau said following his two assist – first star performance. The team wore special pink jerseys which were raffled off during the game and the organization and fans helped add to the $120,000 already raised in previous years in support of the Canadian Cancer Society. Prior to the game the team honoured cancer survivor Marijke Nel who dropped the puck in an emotional moment. It didn’t take long for Halifax to get on the board in the game as Asselin notched his 30th of the season by finishing off a great pass by Durandeau at the 5:01 mark. Keith Getson made it 2-0 Herd when he got the puck to just barely trickle over the goal-line in a play that went to video review after the officials initially waved off the goal. 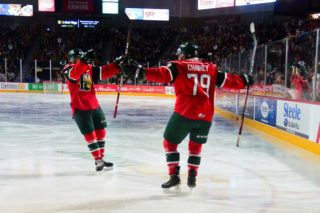 The video concluded that the puck crossed the line with 46 seconds left in the opening period and Halifax went to the dressing room with a two-goal cushion. The Mooseheads kept the pressure coming against the Titan and a pretty passing play with Denis Toner and Bock McLeod was finished off in front of the net by Xavier Parent 2:50 into the second period to increase the lead to 3-0. Acadie-Bathurst got one back a couple of minutes later with the first of their three power play goals on the night. Marc-Andre LeCouffe beat Cole McLaren with Raphael Lavoie sitting in the box for interference. Asselin picked up his second goal of the game in the final five minutes of the middle stanza with what turned out to be the game winner as Durandeau worked the puck out from behind the net and found the team’s leader in goal scoring waiting in front. The tally put Halifax up 4-1 heading into the third period. Lavoie took in inadvertent stick to the face from teammate Antoine Morand as Morand was falling to the ice and the big winger had to go to the room for repairs to his upper lip. Lavoie got stitched up and came back out for the final period and scored an insurance goal in his first shift on the ice. The score remained 5-1 until the final couple of minutes when the Titan put in a couple of power play goals at 18:18 and 19:50 but the game was basically out of reach. Acadie-Bathurst was 3-5 on the man advantage while the Moose were 0-1. Mark Grametbauer took the loss between the pipes with 29 saves while Cole McLaren got his 10th win by stopping 10 of 13. That’s back-to-back wins over Bathurst for the Mooseheads who also nabbed a 4-1 win on Wednesday night at the K.C. Irving Regional Centre. 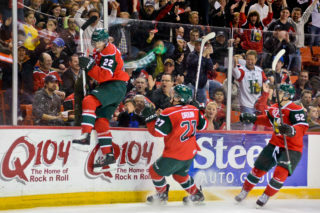 The victory helps the Moose keep pace with red hot Baie-Comeau. 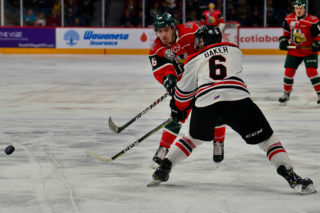 The Drakkar have soared to the top of the Eastern Conference with the league’s best current winning streak and sit two points ahead of Halifax. 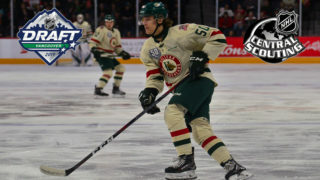 The Mooseheads host an important divisional game Saturday night when the Moncton Wildcats visit at 7pm. QMJHL Commissioner Gilles Courteau will be in the building as will the Memorial Cup and President Cup as part of the QMJHL’s 50th Anniversary Tour. The cups will be on display on the concourse level during the intermissions and fans will be able to take photos with them.